PNEUMATIC CONVEYING, ACTIVE AND PASSIVE SILOS. MIXING AND BLENDING, STORAGE. Hygroscopic products attract and retain moisture. From transporting these materials, to finished production, and all stops in between, any moisture problems can become costly. The absorption of moisture causes many hygroscopic ingredients to stick and clump together. Once these products become sticky, they build up inside silos, conveying lines and mixing machines. We provide systems which prevent condensation in these areas, allowing equipment to operate more efficiently, reducing the cost and time required for cleaning. ELIMINATE CONDENSATION AND FROST IN COLD STORES WITH DEHUMIDIFICATION. Excess humidity in cold stores often leads to condensation and frost build up as the warmer wet air is attracted to the cold surfaces of the chiller. This creates problems for personnel safety, chiller defrost cycles and cardboard boxes. Dehumidification reduces the humidity levels in cold stores which contribute to condensation and frost build up. This is done by introducing dry air into the cold store and extracting the wet humid air. 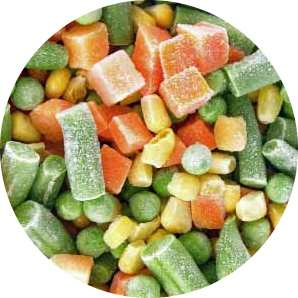 HARD CANDIES, BISCUITS, CHOCOLATES, JELLIED ITEMS, SUGAR COATED DROPS OR TABLETS, SUGAR AND POPCORN. Confectionery products are sensitive products: they often lose quality and shelf life when they come into contact with air humidity that is too high. The solution is to accurately control humidity levels with dehumidification. Our dehumidifiers actively remove moisture and supply dry air to your area. Humidity levels can be kept at the same level all year round. Furthermore, our desiccant dehumidifiers can lessen the load on existing refrigeration systems, reducing defrost cycles and providing savings on energy consumption. VEGETABLES, FRUIT, ANIMAL PRODUCTS AND MORE..
Drying out product is what dehumidifiers do. Take control of your drying process with desiccant dehumidification. We can provide systems to remove moisture from products in the time your organisation needs. Moisture removal is controlled allowing drying time to be constant regardless of outside weather conditions. Condensation and Frost - As warm air mixes with cold air and comes into contact with surfaces. Condensation on roof and surfaces with emitted bio aerosols depositing onto clean product. Increased potential for product contamination, decreased food safety. Moist air making occupants uncomfortable. The only effective solution is to tackle the problem at its source by removing excess humidity from the air. Air Solutions provides superior solutions to air conditioning and refrigeration techniques by physically removing the excess humidity through dehumidification. Thus eliminating frost and condensation and avoiding it's reappearance. This also ensures a clean working environment with optimum working conditions. The most common methods for product drying often increase heat and humidity which in turn increases the risk of mould and fungus growth. This in turn can cause corrosion to machinery and the extra heat can damage the product being dried. Furthermore, with added moisture in the air, the hydroscopic ingredients and powders absorb the excess moisture, making it become sticky and build up inside the conveying lines. The resulting problems slow the process, create sanitation concerns and eventually cause costly down time. Air Solutions instead uses desiccant dehumidification for product drying. Dehumidification physically removes the moisture from the incoming air. This allows for stable inlet conditions, enabling consistent quality and increased performance from the blowing or spray drying process. Process freezing operations are high volume, fast paced production systems that operate continuously to make a profit. High levels of humidity in production facilities (especially during summer) can cause expensive and unproductive interruptions because of the need to defrost evaporators and remove ice from conveyors, floors and walls. Air Solutions provides low dew point equipment which removes the moisture before it can accumulate as ice on your equipment.